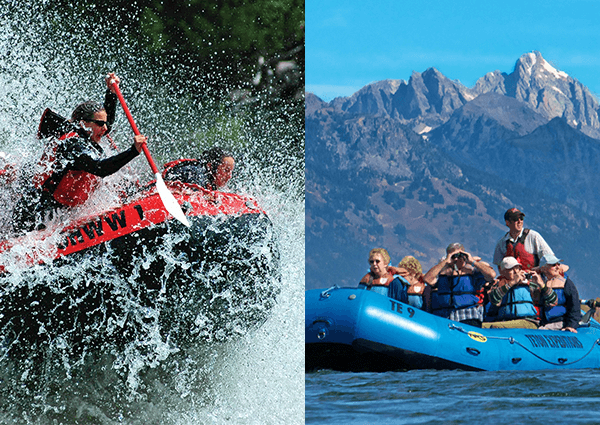 After floating through 13 miles of some of the most beautiful scenery in Jackson Hole, you will be treated to some of the wildest whitewater in Wyoming. The same vehicle that takes you to the river after lunch brings you back to the boathouse. We do this for a reason! You can put on some shorts, sunscreen lock things in your car and use the bathrooms. The second part of the combo is the whitewater trip on the lower part of the Snake River, known as the canyon of the Snake River. On this section you will get wet! This is a class lll river (from l-Vl), with 8-10 sets of some real fun rapids. After every section of whitewater you go through there is a calm section following. This is a very wide and deep river! Great for jumping in for a quick swim! Some sections are up to 80 feet deep. This is a good thing as the shallower rivers can be very technical and rated in the upper V’s. This is a great family river! Also, a great river for all ages who want some big waves. You can book the Classic Whitewater which gives you the option to hang on or the Small Boat Whitewater were every position on the boat paddles. Below you can see some of the action caught on camera.